Put the corn kernels on a baking sheet and toss with 2 Tbsp of olive oil and a little salt and pepper. Roast for 5 to 7 minutes, and then put the pan under the broiler for about 2 minutes, watching carefully, until they get just slightly charred. Set the corn aside. You want about a heaping cup of roasted kernels for the risotto. Heat the stock and 2 cups of water to just under a simmer in a small saucepan. Break the reserved corn cob in two, and add it as well. Add the saffron threads, crushing them between your fingers as you add them to the stock. Season the stock with 1/2 tsp of salt. Heat the final Tbsp of olive oil and the butter in a heavy bottomed stock pot. Add the onion and the shallot and saute until they are softened and translucent. Add the rice and stir to coat, for another minute. Add the wine to the pot and stir while it is absorbed, another minute and a half or so. Start adding the stock to the rice, a ladle at a time, stirring almost constantly, and letting each addition of stock get fully absorbed before the next addition. The pot should be kept at a gentle simmer at all times. After 2 or 3 ladles of stock have been absorbed, add in 1/2 cup of the corn. Keep stirring and adding stock, making sure your pot is simmering and the rice isn't sticking to the bottom of the pan, especially toward the end of the cooking. The whole process is going to take about 30 minutes. After about 25 minutes, taste the rice to see if it is tender. You may not use the whole amount of stock. 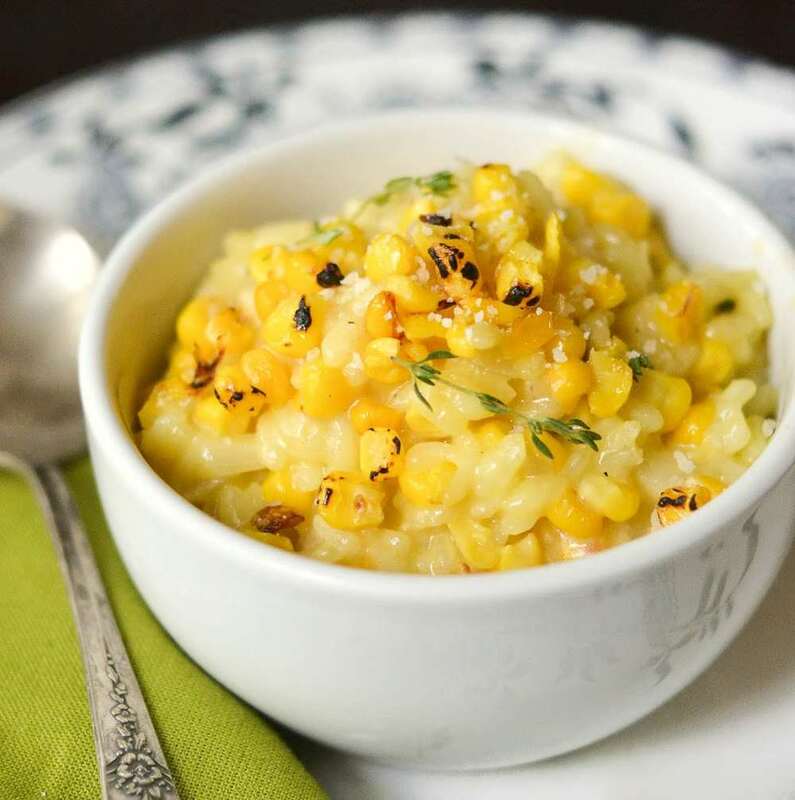 When the rice is tender, add in the rest of the corn, the cheeses, and the fresh thyme. Season with lots of fresh cracked black pepper. Mix everything in well, and then taste again to check the seasonings. Add a little more stock if the risotto seems dry. Serve immediately with more Parmesan cheese on the side.